Mildred “Mickey” Schwab, a longtime resident of Cragsmoor, NY, passed away at home in her sleep to be with Jesus on Thursday, November 29, 2018. She would have been 101 years old on her birthday. Mildred was the daughter of Michael and Mary (Damms) Ryan. She was born in Saratoga Springs, NY on January 28, 1918 and grew up in Ellenville, NY. Mildred was the widow of John G. Schwab of Cragsmoor, NY. Survivors include her children, Joyce Ashley of Eldred, NY, Nancy Bittner of Port St. Lucie, FL, Darlene Mack and Tom Kelly of Monticello, NY, Michael Schwab and wife Bonnie of Calhoun Falls, SC. Six grandchildren, seven great grandchildren and three great-great grandchildren. In addition to her husband, Mildred was predeceased by her sister, Helen Rose, her twin sons, James and John, two grandchildren and three great grandchildren. The family would like to thank everyone from Hudson Valley Hospice, Sister Maria and Father Ken. 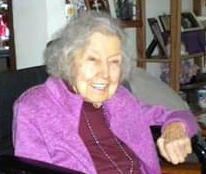 Contributions may be made in Mildred’s name to Family of Ellenville, 221 Canal St., Ellenville, NY 12428.